MOGADISHU, Somalia - The Federal Government of Somalia has boycotted a summit on the country's Oil, Gas and Mining expected to open in Kenya's capital, Nairobi on March 19, Garowe Online reports. IRN - International Research Network which is hosting the two-day meeting under the theme of "Somalia Oil, Gas and Mining Summit 2018" 19th - 21st March has invited Somali PM Hassan Ali Khaire. 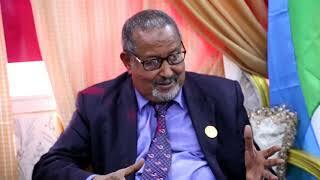 Abdullahi Hamud Mohamed, the state Minister for the Office of the PM sent an approval letter to participate in the coming meeting to the head of IRN Ben Hillary. The letter was posted on IRN's website. The summit will be held with the collaboration of a number of state institutions, together with Somalia's Ministry of Petroleum and Mineral resources and the Central Bank of Somalia, said IRN. The participants will cover the latest development affecting Somalia's extractive and Hydrocarbons Industries, including the new downstream law and PSA Models, the future mining code, and the increased security standards affecting business operations. IRN said International Financial Institutions, such as EfDB, the IMF, and World Bank will provide relevant updates regarding their current funds plan to cover the Oil, Gas and Mining Industries in Somalia. IRN announced that Prime Minster Khaire will open the two-day conference in Nairobi with attendance of international companies interested in investing in the horn of Africa country's national resources. 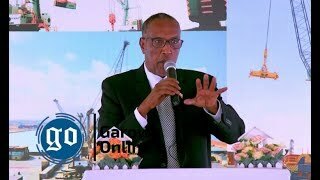 The Minister of Petroleum and Mineral Resources of Somalia, Abdirashid Mohamed Ahmed has released a statement on Monday, Nov 5, rejecting endorsement letter by the State Minister that was sent to IRN. Ahmed has notified IRN's Ben Hillary of his rejection of attending the planned summit in Nairobi on the Somalia's Oil, Gas, and Mining investment, according to the letter exclusively obtained by GO. "It's surprising that IRN is holding a summit on the Somalia Oil, Gas and Mining Summit in Nairobi in March 2017 without the consent of the Ministry of Petroleum and Mineral resources of the Federal Government of Somalia," said the Minister in a letter emailed to IRN head. 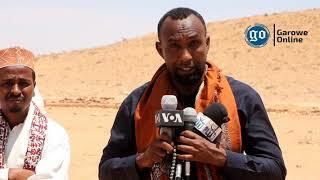 Ahmed said IRN's announcement of hosting the conference has sparked confusion between the Ministry of Petroleum and Oil firms as the Somali Federal Parliament debates law to regulate oil, gas exploration. The Minister has called on IRN to immediately call off the controversial meeting in Nairobi. The main reason that has led to the boycott of the Nairobi meeting on Somalia's Oil, Gas and Mining is reported pressure on the Ministry of Petroleum and Mineral resources of Somalia from the UK-based Soma Oil and Gas to stop the IRN Summit on Somalia's Oil, Gas, and Mining industry. There have also been some other reasons, including lack of collaboration among the Council of Ministers of Somalia, some allied to PM Khaire, while the Petroleum Minister has close links to Fahad Yasin, Villa Somalia chief of staff. Soma Oil & Gas firm, which is a private firm founded in 2013 pays to the employees and expenses of the Somali Petroleum Ministry as it pursues Oil and Gas exploration opportunities in Somalia. "This is contrary to the International Standards and intervenes in the Ministry of the Petroleum to independently execute its mandated powers, it's conflict of interest," said an Oil Exploration expert based in Nairobi while speaking to GO over the phone on condition of anonymity. Soma Oil and Gas said in a statement published on its Website that it reached an agreement with the Federal Government on 6 August 2013 with the objective to promote the oil and gas sector to attract investment and activity, boosting Somalia's economy and helping the process of normalization. Hassan Ali Khaire has worked with Soma and Oil company as its Executive Director for Africa since its inception in 2013. He has resigned on Feb 23, 2017, on his appointment as the Prime Minister of Somalia. 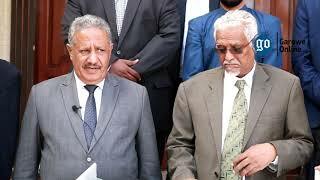 The statement of the State Minister for PM's Office that was rejected by the Petroleum Ministry is a sign of a deadlock between cabinet members over national issues. 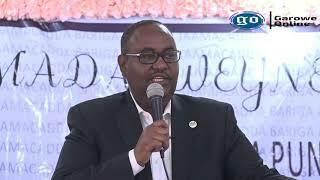 In September 2017, the State Minister of the Interior has endorsed the reported sacking of Galmudug state President Ahmed Dualle Geelle "Haaf" by state MPs as the Interior Minister was on an overseas trip.